Because I was going to see Out of Joint’s production of All That Fall. 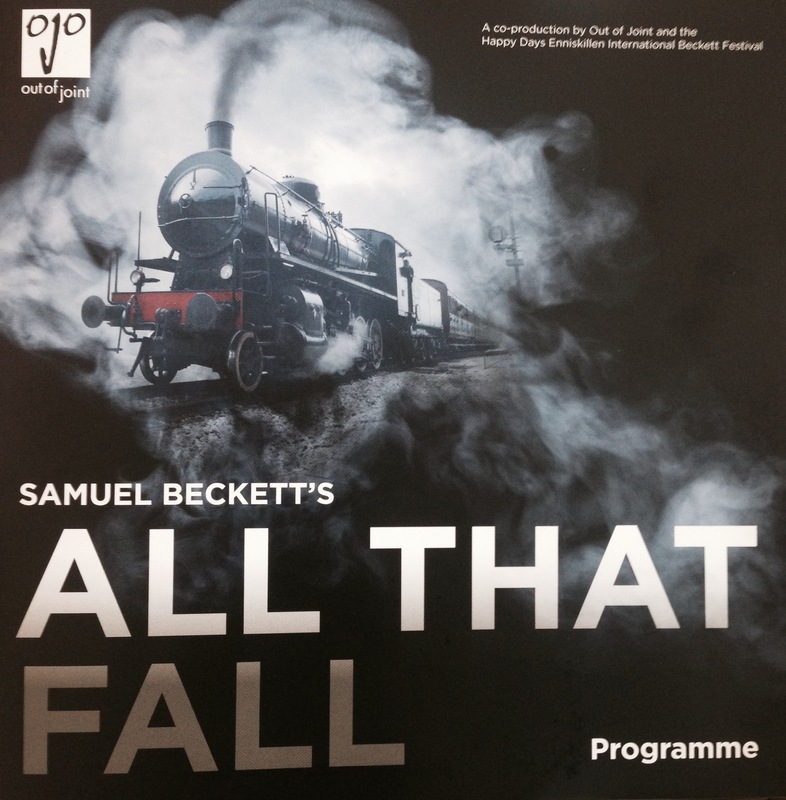 This was Beckett’s lush, lyrical radio play that I read at university and had wanted to ‘see’ for years. I loved the rhythm and flow of the words, the story of Mrs Rooney travelling to the station to collect her blind husband as a surprise on his birthday. Theatre company Out of Joint’s answer to this is simple: blindfold the audience. Stripped of sight, the play is a very intimate, immersive experience. All That Fall takes place in the low lit Victorian brick surroundings of Wilton’s Music Hall. Within a few seconds, I found the music hall was merging with a country Irish road populated with larger than life characters. Mrs Rooney is a complex woman. She is funny and full of self-pity; she is also determined and loving. Maddy Rooney will get to the station to collect her husband, no matter what setbacks may befall her on the way. There are many wonderful 3D sound effects. A bicycle weaving through country lanes, a horse very reluctantly starting to pull its dung cart and a train speeding through the station, so close I could almost feel the wind on my face as it sped by. The actors move among the audience all the time. Sometimes they are on the opposite side of the auditorium, sometimes they are right next to me, creating long shots and close ups inside my head. This dynamism means each audience member gets a different experience and perhaps an alternative perspective on what did – or didn’t – happen on the train. This aural-only landscape provides both slapstick humour and darkness. There’s Mrs Rooney the ‘big fat jelly’ being hoisted up into Mr Slocumb’s car. And the train is delayed – for a tragic reason. Go to All That Fall and see what happens in your mind’s eye. Decide how big – or not – Mrs Rooney is – and decide for yourselves whether the very dark end to the play really did occur.